At the end of the spring semester, you might have noticed several bright blue bike racks pop up around campus. They are a part of Relay Bike Share, a program partnered with the City of Atlanta to help make bicycles more accessible to residents. It is a bit like ZipCar for bicycles. The student membership costs $7.50 a month, and includes 90 minutes of free time per day. Getting a bike is relatively straight-forward. You can book a bike through the app or on the bicycle’s keypad. Then, you enter your 4-digit PIN on the keypad on the bicycle. When your trip is over, you can return the bike to a Relay station (or a rack within 100 feet if the station is full). For a small fee, you can lock the bike to any other public bike rack. Relay Bikes is owned by a private company called CycleHop and was launched in Atlanta in June 2016 with 100 bikes and 10 stations. In April, they expanded to 500 bikes and 65 stations in various areas such as downtown, midtown and West End. For Tech, this meant new locations including Tech Square, Tech Parkway, the Transit Hub, Bobby Dodd Stadium, Clough Commons and the CRC. “We had to find locations that would serve a great number of people while still being feasible as part of the campus landscape fabric — we worked with several GT departments to determine the locations. We attempted to space the stations where they would be easily accessible and meet demand but we can move them in the future if data supports this,” said Lisa Safstrom, Georgia Tech Campus Transportation Planner. “The city has shown increased support for cycling in the past few years and has made great progress to improve bike infrastructure. Georgia Tech had concurrently been looking at implementing bike share on campus. We evaluated a few options but when we heard about the City’s program coming along, that seemed like a great fit,” said Safstrom. With Relay Bikes, there’s no need to worry about maintenance or locking up your bike. The program serves as a complement to the already existing BuzzBike program. One of the biggest aspects for improving cycling infrastructure is to get more bikes on the road. “This was our intention with the BuzzBike program — offer students an opportunity to ‘own’ a bike for a few months, to get used to commuting by bike. Ideally, they would realize what an efficient, cheap and fun way to travel this is — and they would then purchase their own bikes and continue to bike as part of their lifestyle. The Relay bikes, on the other hand, are great for folks that may not want to commit to biking but appreciate that it’s very handy on some occasions. 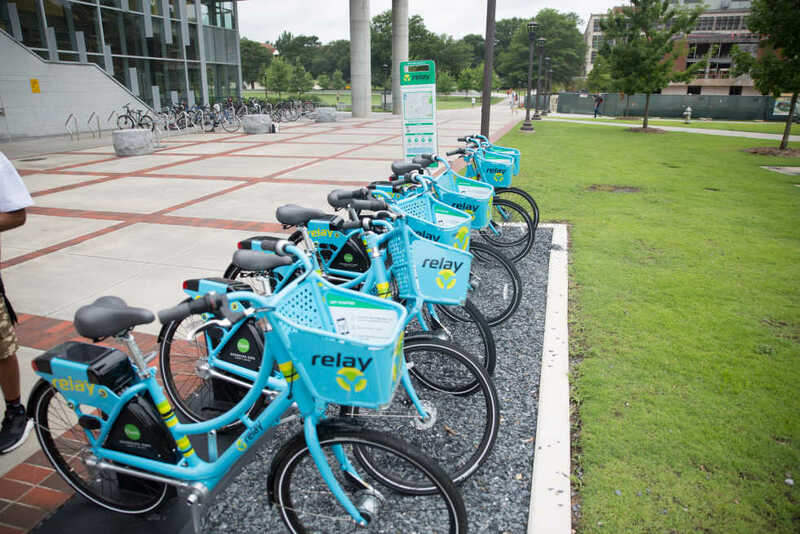 Using Relay bikes to get to meetings, to go to lunch, ride to MARTA or to see the sights downtown or at Piedmont Park is easy, since there are Relay stations located at many destinations throughout the city,” said Safstrom. When Relay Bikes first started, many doubted that the program would take off. “Biking in the city and on campus has been increasing every year and we’ve all been working to improve infrastructure and programs to encourage and support this. We all want a safe and accessible network for biking, and offering Relay Bike Share on campus is a great way to increase the numbers of people using bikes,” said Safstrom. “RideShare is important because public transportation and public access to getting to MARTA stations, getting to class and getting the bus is something that’s fun. It’s good for your health in the city. Atlanta has a lot of green space for a city which is really beautiful to look at and you get to get a different view of the city when you bike as opposed to sitting in a car,” said Jones. The construction along Tech Parkway is another initiative to improve bicycle infrastructure on campus and in the city. With expected completion in July, the project converts one side of Tech Parkway (from Northside Drive to North Avenue) to a bike path and new sidewalk. “This will serve as a bicycle connection from new and coming infrastructure northwest of campus to the new Luckie Street cycletrack (a two-way bike path protected by a concrete curb) that leads downtown to Centennial Olympic Park, where it will meet other bike paths extending east,” said Safstrom. Relay Bike Share staff will be on campus in the Fall providing outreach and looking for student ambassadors in trade for free membership.